What do a town in northern Italy, a casino in Las Vegas and a café in Waverley all have in common? They all share the same name – Bellagio. The waitstaff of this establishment proudly wear shirts bearing the café’s name on the front and their first names on the back. Amy, our waitress, was friendly and attentive throughout our visit despite the hustle and bustle. Seating was at a premium when we arrived but a table was quickly found and cleaned for us. On a warm summer day the front windows can be opened up to allow a pleasant breeze to blow through the main room. There is filtered water available for self service and we were happy to see that they use reusable cups. They have made good use of the café’s street corner footprint with tables and benches outside at the entrance, spacious rooms inside and a courtyard at the rear with plenty of toys to keep children entertained! At Dane’s request we’re going to go straight into the fruit drinks today because this is where Bellagio’s menu jumped off the page. 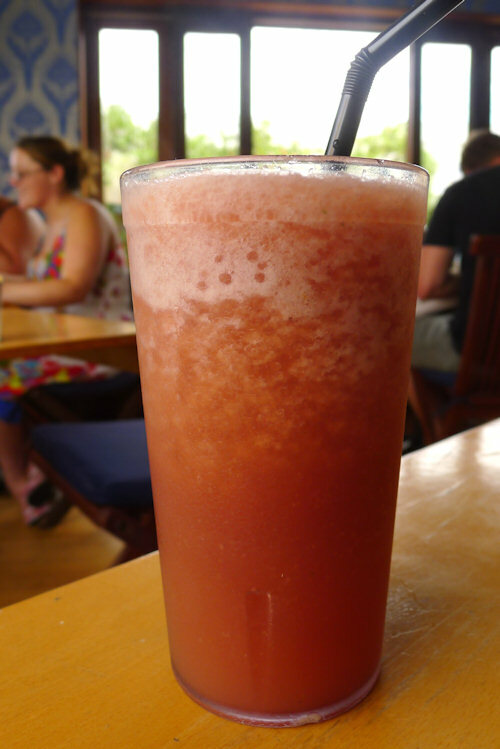 Fresh juices are available with any combination of the following: orange, pineapple, apple, tomato, carrot, celery, ginger, beetroot, mint, watermelon and rockmelon (kids $5, small $6, large $7). Frappes are available with any combination of: orange, pineapple, apple, mint, raspberry, strawberry, blueberry, passionfruit, watermelon, rockmelon and mango (small $6, large $7). Wow! Bellagio, we love you! 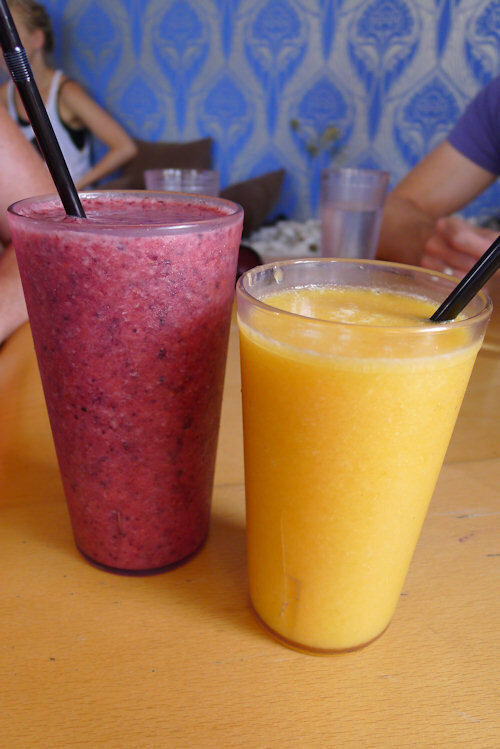 Both of our frappes (one with strawberry, raspberry and blueberry and the other with mango, passionfruit and orange) were exquisitely blended, served cold and with fresh ingredients. We really couldn’t ask for anything more. If you’re not sure what to order, be sure to check with the waitstaff as they will be able to offer some recommendations. April tried a watermelon, apple and mint juice which was refreshing and light. She found that the watermelon didn’t provide a very strong flavour so we’d recommend adding a fruit with a bit more kick to the watermelon – passionfruit. pineapple or mango. Everyone at our table was very pleased with their coffees. They had been brewed well and were not too burnt or weak. 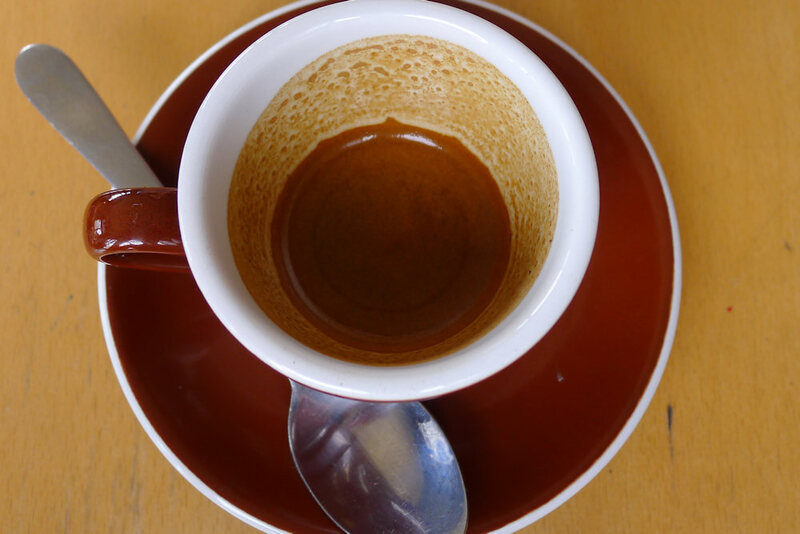 We ordered an espresso ($3.50) which was delicious. 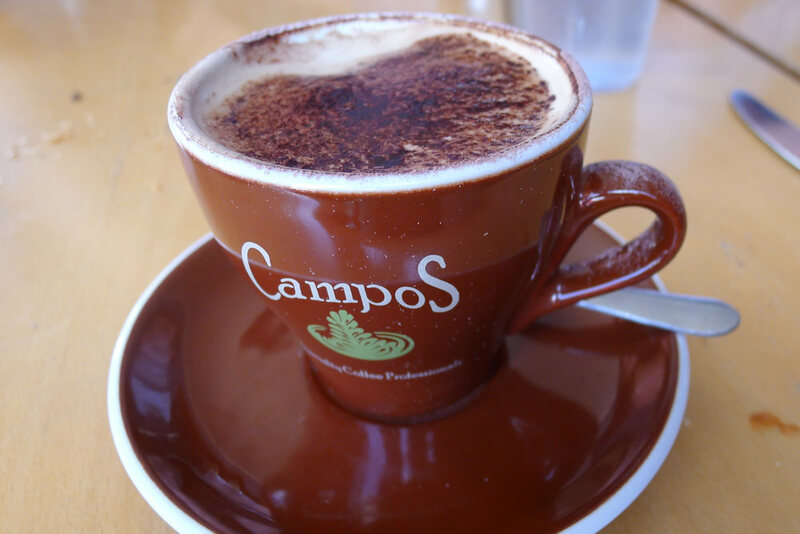 The skim cappuccinos and flat whites ($3.50) were also superb and can be ordered strong for an extra 50c. 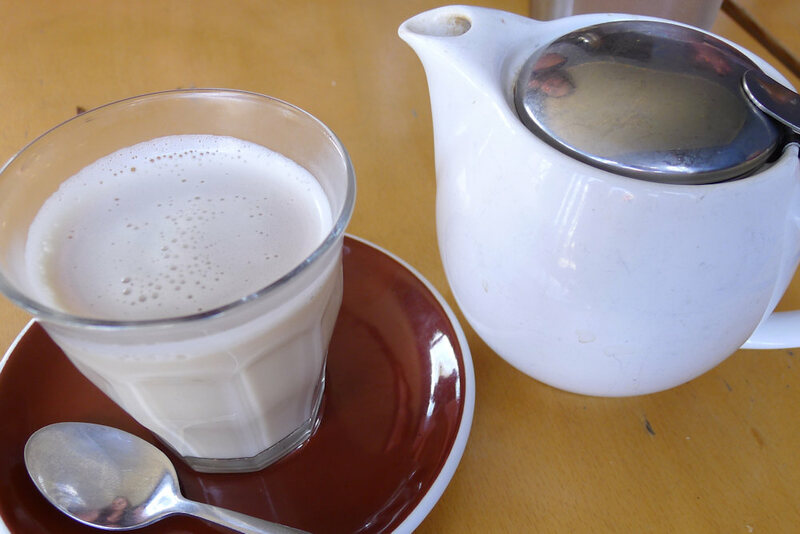 April was happy that the soy chai latte ($4.50) came as loose leaf tea with the soy milk already added. The flavours were strong and comforting and the serving was ample. 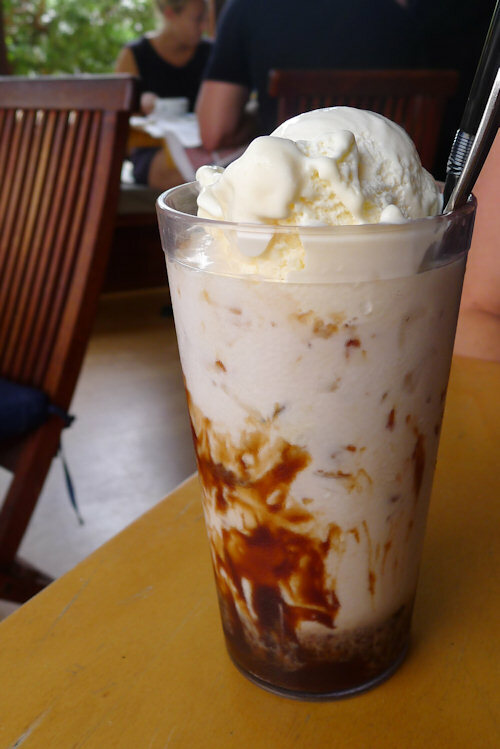 Our guest, Kate, ordered the iced chocolate ($6). She enjoyed the ice that was mixed in with the ice cream as it kept the drink cool for longer. The serving was very generous and included a lot of ice cream and lashings of chocolate. The plastic glass did detract from the presentation of such a luscious drink though. 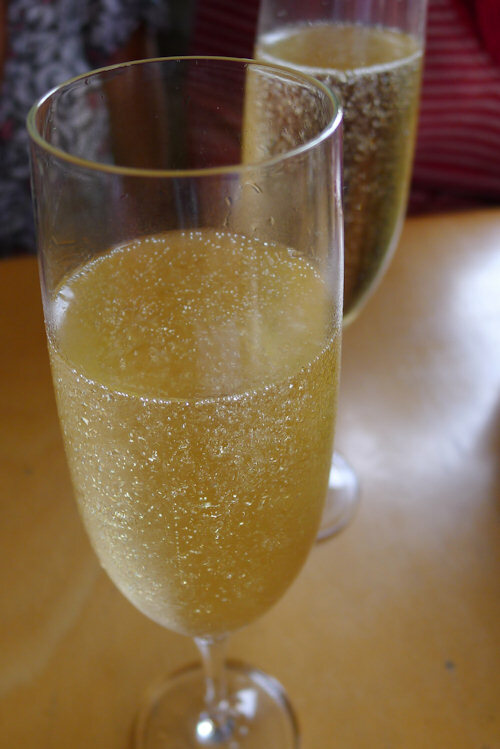 This may be the first licensed Australian café we have visited so some of our guests took the opportunity to enjoy a glass of Grandin Classiqe Brut sparkling wine (glass $7, bottle $26). A small selection of beers is also available. 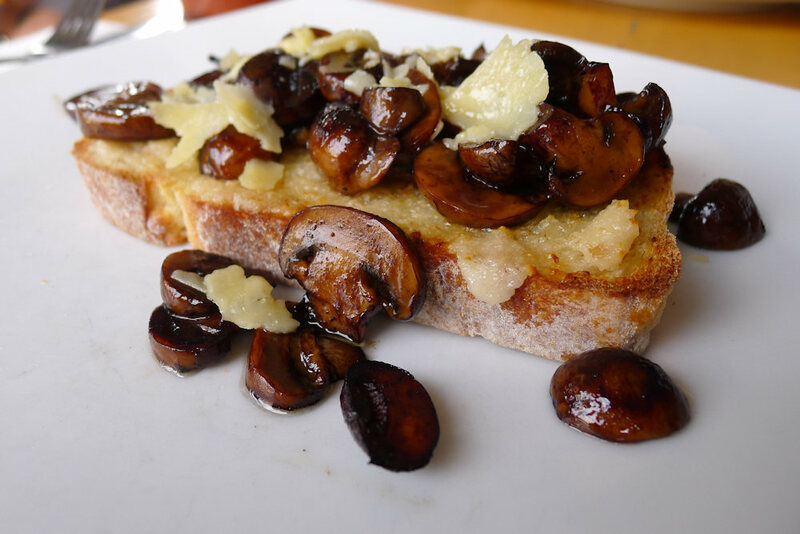 The mushrooms on toast ($8) looked like a small portion when it arrived but was perfect for April. The garlic was in abundance and complemented the parmesan and mushrooms. There was a layer of melted cheese underneath the mushrooms as well as a shaving on top. 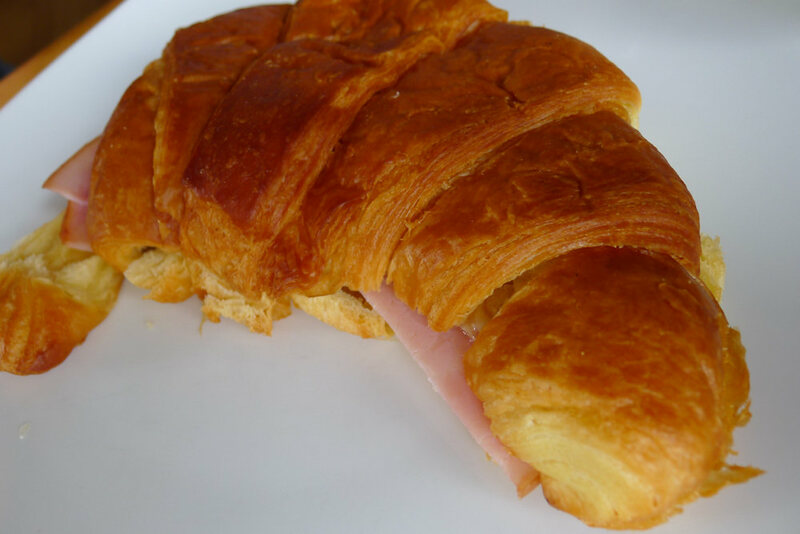 The ham and cheese croissant ($7) was enormous and filled with plenty of leg cut ham and cheese. Such a simple snack, served elegantly but with a great taste. 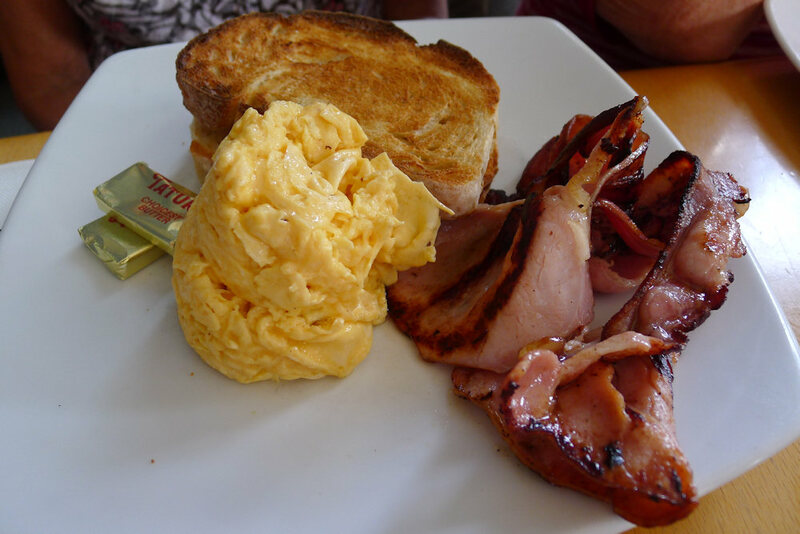 Eggs can be ordered any way and one of our guests ordered scrambled eggs with a side of bacon ($9 plus $4). The eggs were light and cooked thin like crepes. We liked how they were piled up in a tower and could be unravelled at the diners delight. Although the dish was well prepared, our table began to rock as she battled to cut through not only through the crust of the toast but the toast itself. Even a steak knife would have had difficulty. Our guest, Wendy, ordered the corn fritters ($10) which were spherical in shape rather than flat which is how we have normally seen them served. They were not starchy and had plenty of corn and herbs. 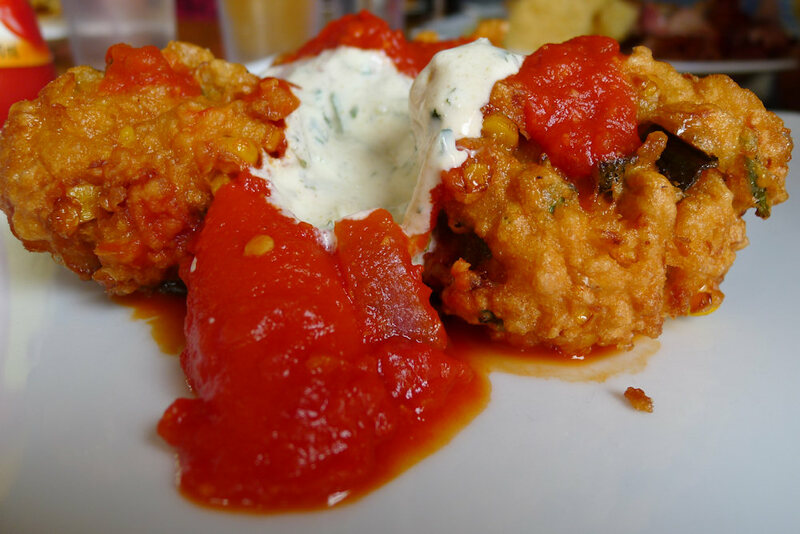 They were served with tzatziki and a tomato salsa which were great accompaniments and made these fritters totally unique to any others we have tried before. A highly recommended dish. 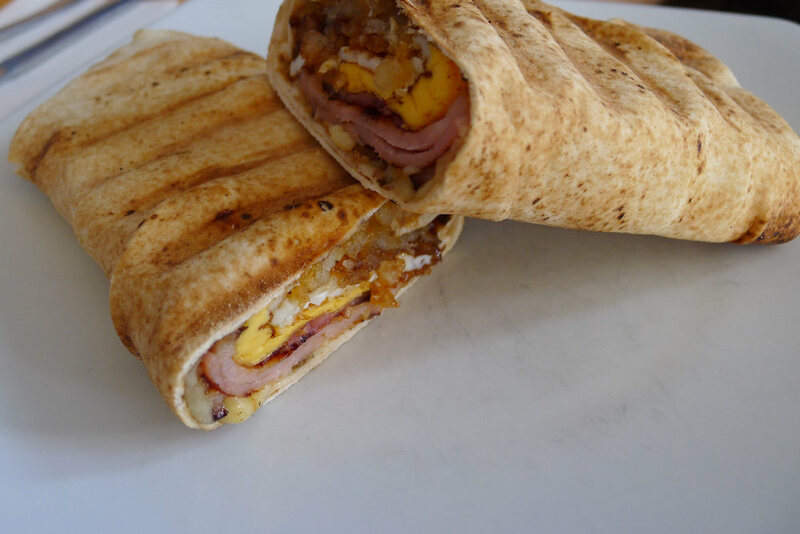 The breakfast wrap ($10) looked absolutely amazing. It was packed with bacon, egg, hash brown and BBQ sauce. Our guest said that he enjoyed it although parts were a bit dry as though only some of the wrap had received BBQ sauce. It had been toasted which also would have dried it out so perhaps slightly undercooking the egg before toasting would have made it more moist. The big breakfast equivalent is the Bellagio breakfast ($18) which comes with bacon, egg, tomatoes, mushrooms and hashbrown. One of the poached eggs was still runny while the other was slightly dry due to the cooked-through yolk. 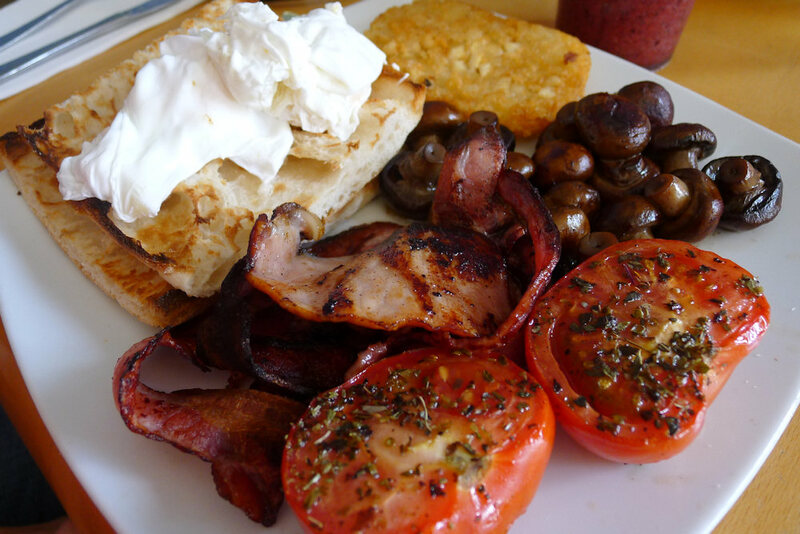 Everything else on the plate was hard to fault – beautifully herbed tomatoes, perfect mushrooms (which didn’t have the abundance of garlic like the garlic mushroom dish above) and a gorgeous, moist hashbrown. The Turkish bread would have been a nice substitute to the hard sourdough in the scrambled egg dish. 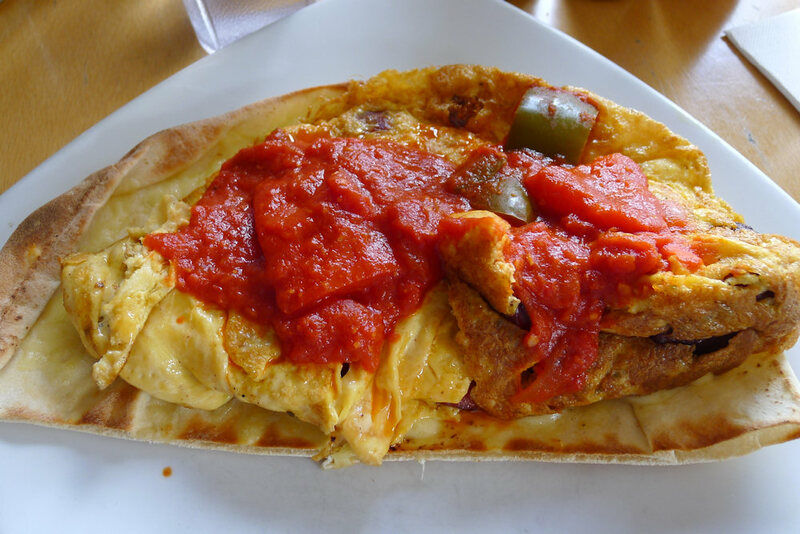 The ranch breakfast ($15) features a chorizo-filled omelette covered in a capsicum and “spicy” tomato relish. This is all served on a pita bread base which itself has a layer of melted cheese. This was a superb combination of ingredients and turned what would have been a good omelette into an extremely tasty dish. There was no shortage of chorizo and the relish was full of flavour but not very spicy. Our daschund, Hugo, was also treated very well by the staff at Bellagio. While he patiently waited outside, they benevolently brought him water and a sausage! 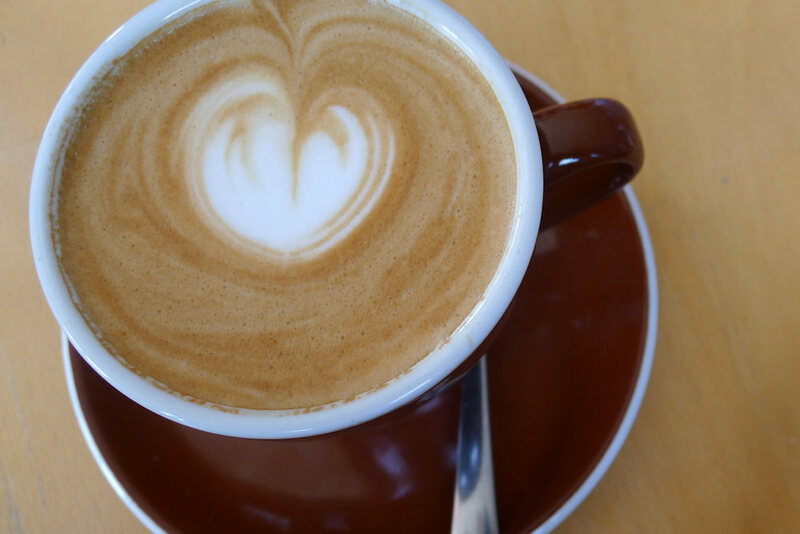 We thoroughly enjoyed our visit to this welcoming café. Both their food and drink menus are expansive and have some fantastic items. Be sure to pay them a visit if you’re in the Eastern suburbs. 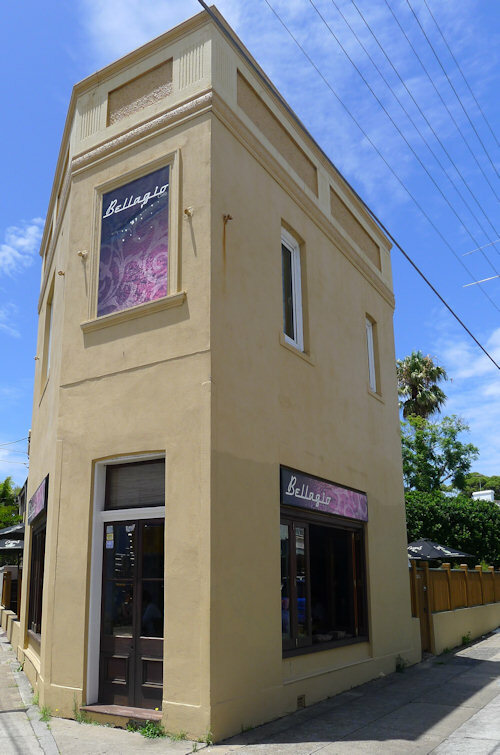 Bellagio is close to Bronte Beach and Centennial Park. If the weather is good we recommend a walk around the coastal track from Bronte to Bondi followed by a swim at the beach. Beware of the rough surf around Bronte and Tamarama Beach. Bondi is safer for inexperienced swimmers but be sure to stay within the lifesavers’ flags. It’s hard to find parking around the beach so leave your car at home or park a good distance away. If you’re not interested in the beach you can check out the shops on Oxford Street, Paddington which is about a ten minute drive away. 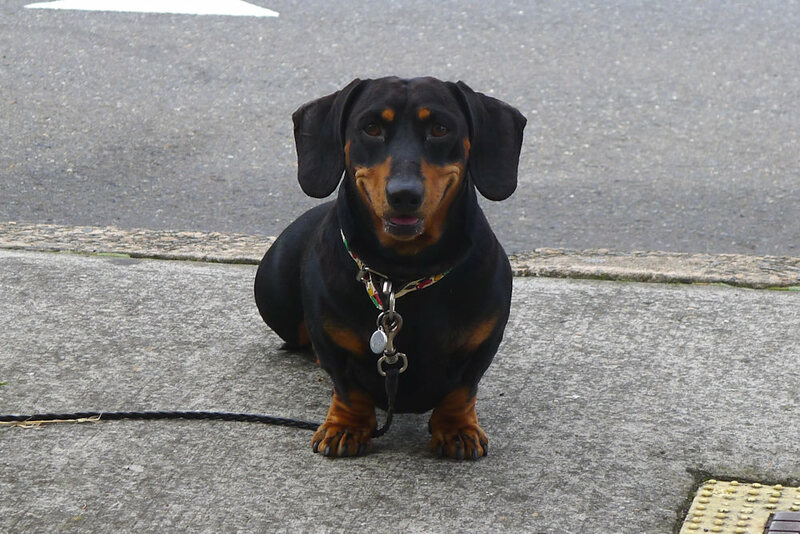 This entry was posted in Sydney - Eastern Suburbs and tagged Parking close by. Bookmark the permalink.